One approaches The Book Artist by Mark Pryor, the latest instalment in the Hugo Marston crime-solving series, with a decent glass of red wine and a cozy fireplace (or heater). 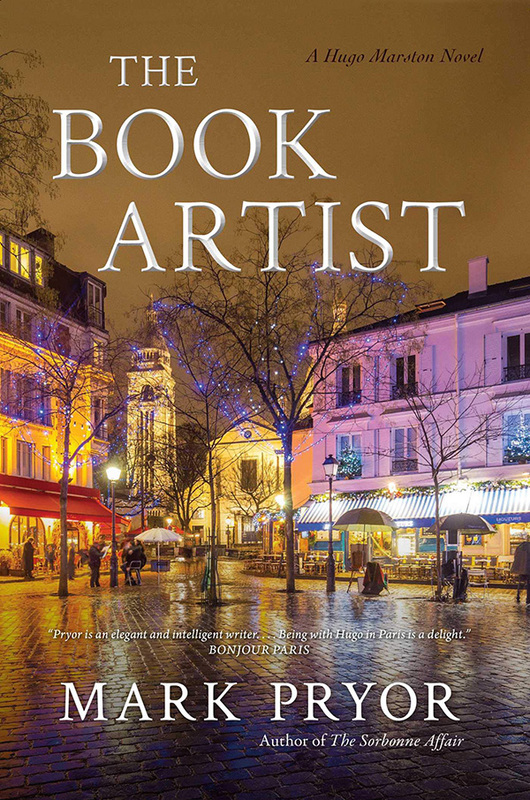 The author can be relied upon to deliver a clever, multi-stranded, crime story set in the glamourous world of present day Paris. It is populated by charismatic personages in the shape of the US Embassy’s Head of Security, his Ambassador to France boss (ex-covert ops) and a best friend (more ex-covert ops). This is the eighth in the series to date, with most set in the carefully diplomatic world of the American Embassy in Paris. The opening chapter sees Hugo and the Ambassador set to attend an art gallery opening of an emerging American artist. Problems arise and the body count commences. Weave in a sub-plot centred around Hugo and his best friend for an old murder case and the first cliff hanger emerges. This series continues to, happily, showcase the fine line Hugo and his embassy colleagues tread when assisting American citizens in trouble with the French police and their own good working relationships with same. The author keeps the action moving along at an enjoyable pace, occasionally touching upon the darker sides of Hugo and the Ambassador’s former jobs. The series is possibly best enjoyed by starting with the first novel, The Bookseller, as subsequent instalments expand upon the main characters’ backgrounds. The SMSA holds the entire series to date.